Achieve calm, manageable locks with Alterna Caviar Anti-Frizz Butter; a lightweight formula that delivers multiple benefits, including taming unruly, medium to thick hair. Powered by Caviar Extract and a nourishing blend of Avocado, Camellia and Abyssinian Oils, the cream-to-oil butter provides thermal protection up to 230°C, whilst reducing blow drying time for easier and quicker styling. Humidity resistant for up to 72 hours*. Expect sleek, smooth strands with enhanced shine and a salon-worthy finish. Ideal for medium to thick hair. 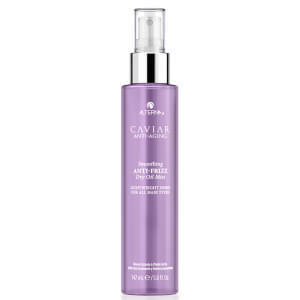 *Based on a clinical study, with use of Caviar Anti-Frizz Shampoo, Conditioner and Blowout Butter. Нанесите на ладони количество средства размером с пятирублевую монету и взбейте до образования пены. Равномерно распределите по чистым, подсушенным полотенцем волосам перед укладкой феном. Water, C32-36 Isoalkyl Stearate, Cetyl Alcohol, Glyceryl Stearate SE, Butylene Glycol, Lauryl Laurate, Isopropyl Palmitate, Phenyl Trimethicone, Isododecane, Cocos Nucifera (Coconut) Oil, Dimethicone, Algae Extract, Ascorbic Acid, Astrocaryum Murumuru Seed Butter, Behentrimonium Chloride, Bis-Cetearyl Amodimethicone, Bis-PEG-18 Methyl Ether Dimethyl Silane, Camellia Oleifera Seed Oil, Candelilla/ Jojoba/Rice Bran Polyglyceryl-3 Esters, Carthamus Tinctorius (Safflower) Seed Oil, Caviar Extract, Cetearyl Alcohol, Citric Acid, Copernicia Cerifera (Carnauba) Wax, Crambe Abyssinica Seed Oil, Disodium EDTA, Glyceryl Stearate, Glycerin, Helianthus Annuus (Sunflower) Seed Oil, Olea Europaea (Olive) Fruit Oil, Persea Gratissima (Avocado) Oil, Phospholipids, Polyacrylate-1 Crosspolymer, Polyquaternium-11, Polysilicone-15, Sodium Stearoyl Lactylate, Stearic Acid, Superoxide Dismutase, Theobroma Grandiflorum Seed Butter, Trichilia Emetica Seed Butter, Ethylhexylglycerin, Phenoxyethanol, Fragrance (Parfume) (10-17-7405).